Sunny weather but with a chill to the air. Beautiful. Still warm enough for bike rides in skirts with bare legs but with a thin sweater and perhaps a striped scarf for warmth and a bit of flare. Yesterday Cornelius and I were heading to a potluck and our main dish had to be portable by bicycle (it’s our only mode of transportation), so no sloppy meals need apply. I wasn’t sure what others would be bringing, so I decided to try my hand at a polenta casserole. Something that would warm the gullet (and my bare legs) after the bike ride. I had only 1 prior experience with polenta (about 10 years ago) and I wasn’t pleased with the results…but something pushed me to try again and I’m so glad I did. 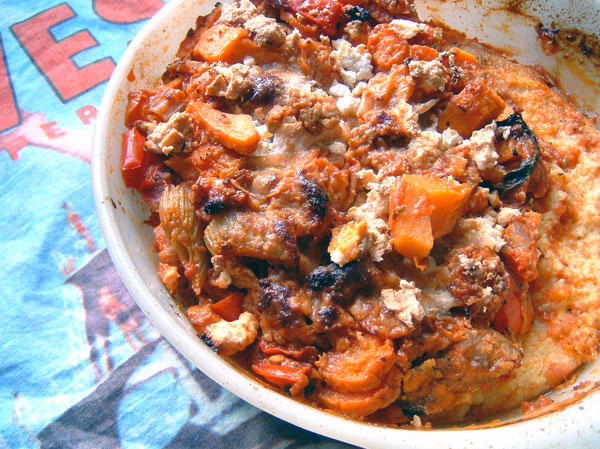 I looked in one of my cookbooks to figure out how to prepare the cornmeal mush and figured that I’d top it with a tomato-sausage-fall vegetable stew and then bake it in the oven, topped with cheese. I made the stew part up on the fly with ingredients I had in the house and I was amazed with the results. So, how did we manage to carry this on our bikes without spilling? Easy. We packaged up the 2 pans of chilled polenta in plastic wrap and then put the warm stew into a non-spill plastic container. We brought the cheese with us in a little baggie and Cornelius carried the whole thing on his back in his oversized messenger bag. Once we got to the potluck, we assembled the whole thing and baked it then and there. 45 minutes later, we not only had our polenta casserole to munch on, but our host Randy had made Nigella Lawson’s recipe for Soft and Sharp Aubergine Involtini which was so tasty. Needless to say, we only made it through one of my 2 casseroles, so I got to take the extra one home. The photo here is how it looked after being transported last night back home. A little less picturesque with the topping slanting to one side but as I can attest, still delicious for lunch. Heat olive oil in a large cast iron pot and add sausage and break apart with a wooden spoon until no longer pink. Add the onion and garlic and cook until translucent. Add the carrots, celery, sweet potatoes and the herbs and spices and continue to cook on medium heat for several minutes. Add the red pepper and cook until tender. Add the tomatoes, tomato paste and red wine or broth and cover, stirring occasionally. Once vegetables are tender, about 20 – 30 minutes, remove from heat and spoon the stew mixture over top the prepared polenta. Top with cheeses and bake in a 375 degree oven for 45 minutes. Allow to rest 15 minutes before serving. * I also think some eggplant, zucchini, broccoli or cauliflower would be delicious here. Sounds good! I’m envious of your autumn weather…we were at 105 degrees today here in Austin. Crystal, yikes that’s hot for late September, even by Austin’s standards I’m sure. The crisy weather here is so nice for baking and whipping up all kinds of autumn foods. Thanks AK for including my recipe. 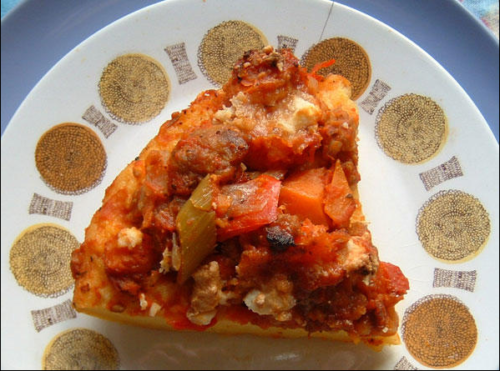 The recipe can very easily be vegetarian if you just get rid of that darn sausage! This looks terrific! I found you via AK’s veggie picks and will definately give this a shot for dinner soon. Excellent Nic, I hope it works out for you. I loved it and am now a full polenta convert and I can’t wait to try more polenta recipes. We just started having polenta earlier this summer and this looks like something we will have to make at some point. I like polenta a lot more than I thought I would! yeah, i was surprised at how much i ended up liking the polenta. even my husband was surprised, as he claimed not to be a fan! it was easy and tasty. Feta and parmesan on polenta ~ hot damn!